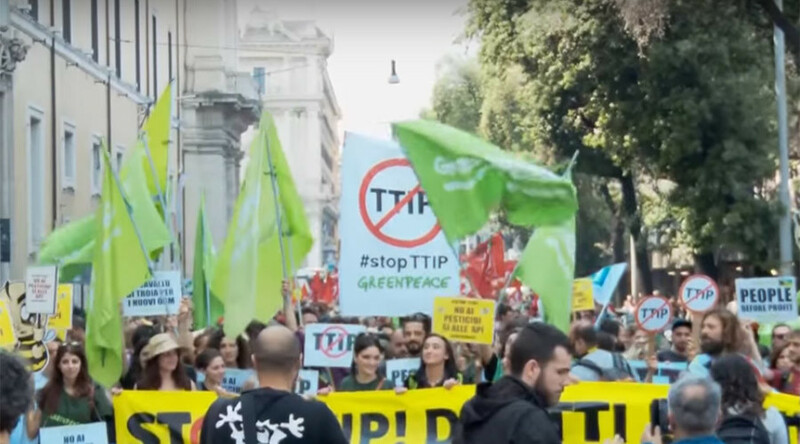 Tens of thousands came out in the capital of Italy to decry the secretive Transatlantic Trade and Investment Partnership (TTIP) deal between the EU and the United States, which protesters believe would push Europe into corporate slavery. Demonstrators gathered in Rome’s San Giovanni Square holding up anti-TTIP banners reading, “American chicken filled with hormones on our tables? Stop TTIP,”“People before profits,” and “Free circulation? Not capital, but people,” while chanting slogans denouncing the treaty. Protesters believe the treaty will lead to a deterioration in agricultural practices, as well as quality of work and services. “Firstly, because it accelerates privatization, and secondly because big corporations will rule over European governments,” demonstrator Loretta Boni told RT’s Ruptly video agency. Saturday’s demonstration was organized by one of Italy’s largest trade unions, the General Confederation of Labour (CGIL). The trade deal has been strongly opposed by Europeans, with hundreds of thousands taking to the streets in Germany, Belgium, and Spain to protest. The most recent poll conducted by German broadcaster ARD revealed that 70 percent of Germans oppose the TTIP trade treaty. This constitutes a massive drop in support compared to 2014 surveys, where a similar poll found that 55 percent of Germans viewed the deal negatively. The decline in enthusiasm has been even sharper in the US, despite President Barack Obama’s push for the deal. Only 18 percent of Americans believe TTIP is a good thing, compared to a sizable 53 percent in 2014. Supporters of the agreement believe that TTIP will create the world’s largest free-trade zone, which would lead to a more integrated marketplace and benefit small businesses by opening up markets and making customs processes easier. They also argue that it would reduce trade tariffs on products. Critics, however, say TTIP would place corporate interests above that of nations and workers, arguing that international corporations would be given power at the expense of small and medium-sized businesses. TTIP opponents have also been taking an especially harsh stance against genetically modified (GM) crops, as the deal could allow US companies to bypass EU regulations and sell GM products in Europe. The secrecy surrounding the talks has also come under severe criticism. On Tuesday, Greenpeace Netherlands published leaked documents suggesting that climate protection, jobs, food safety, and online privacy rights will be whittled away under the deal. The negotiation texts were reportedly obtained from an unknown source. WikiLeaks has been offering a €100,000 reward for documents revealing the details of TTIP.